Animated films will never stop to amaze me. They have their specific ways to reach out to the younger viewers’ minds, delivering exquisite subject matters, the point of which even adults miss at times. For instance, why do we need to talk about death or life? When does it start or ends for a human? What happens before or after one closes their eyes forever? And what about eternity or life after death? What happens to people after they die? Do the dead remember us – the living? Do they remember their kids, or the kids of their kids? I do not have answers to these questions. In fact, nobody can ever have a definite answer. But that’s what I thought before I watch “Coco” produced by PIXAR and co-directed by Lee Unkrich and Adrian Molina. I must say, this animated film opens quite a tricky concept, and delivers it to kids in a very sentimental way. The Rivera family are troublemakers in a best sense possible. They are cute, adorable, funny, determined, and very stubborn. The family members stick to these qualities as family values even after they die. Miguel – the lead character is going to learn about this firsthand. Miguel it not allowed to practice music in any form due to the ancestral past. The young boy is forced to continue the family tradition as a shoemaker, but music and art are rooted deep in his heart. Realizing, that he has to follow his heart, the young boy enters the Land of the Dead on the Day of the Dead to change the family curse for good. What happens next is truly magical. Every year on this important holiday dead people are allowed to return and celebrate their afterlife existence for one day. They can visit their loved ones – but only those who still remember them, keep their pictures and share memories of them. Wanting to prove his point, Miguel (voiced by Antony Gonzalez) is determined to continue the path of his great-grandfather Ernesto De La Cruz (voiced by Benjamin Bratt). The great-grandfather had been a world-known musician once, and his guitar is still kept in the town square, where people can admire it. Miguel decides to borrow it, but once he does that, he is immediately transformed into the Land of the Dead, where he befriends Hector (voiced by Gael Garcia Bernal) and other deceased family members. I can go on and tell you what happens next to Miguel and why the family members’ blessing is the only way for Miguel to return the land of the Living. And I can even reveal the reason why Hector has to meet his abandoned daughter for the very last time before he vanishes forever, but the beauty of “Coco” is in discovering the story by yourself. The excellent music, the culturally rich Hispanic characters and the perfect narration of the stellar cast made me watch this film two days in a row. In addition to that, it is educational and has found a beautiful way of showing to kids why it is important to be gentle, kind, and loving toward others. And this should not be forgotten even after departing from this world for the next one, hopefully. 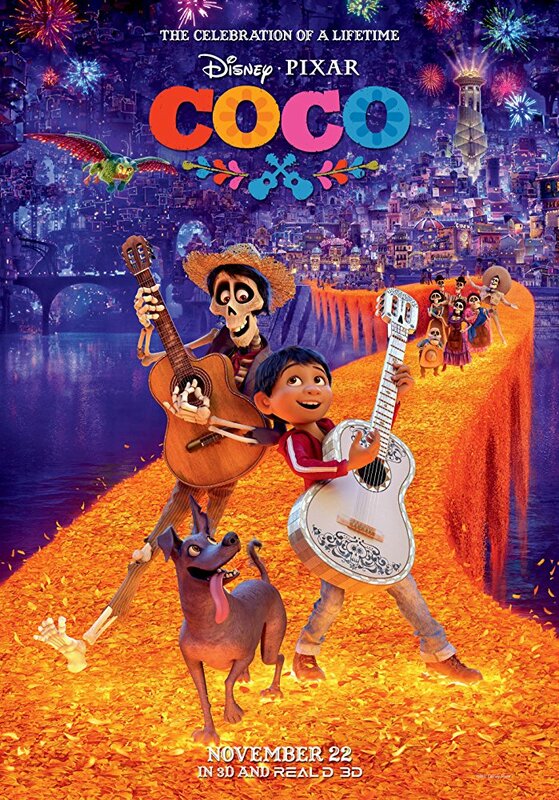 Overall, “Coco” is a super adorable animated film from start to the very end. It’s funny and wicked. It’s strangely sad and touching. Everything about it will make you want to hug your loved ones. It’s one of those films that make people reveal themselves emotionally. It reminds us why we are genuine and sentimental human beings, and why it is important to remain that way. One thing Miguel and his ridiculously hilarious family will teach you is to always do what needs to be done – but, with precautions. Share only good memories and appreciate your loved ones. Music is everything, and art is worthwhile living for. But those who are beside us every day should never suffer because of us being endlessly busy. And remember – one can never bring back the lost time.